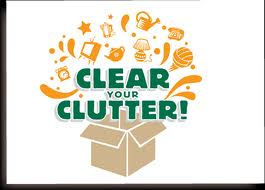 It’s time to clear the clutter! In Dallas it is rare that we have snow days, but today is one of those days. I figured out this is my chance to slow down and clear the clutter. Many times in life we are just going and going and we don’t realize that we need to get rid of stuff that is not serving us. I know I have a problem with keeping things for years thinking I might use them later. But I learned that keeping things stops you from having room for new things and now I am very open to receive all NEW & EXCITING things coming in my life. Join me as we CLEAR THE CLUTTER.